Jo’burg’s Linder Auditorium resounded with passion and music on Saturday night, when the two 2016 SAMRO Overseas Scholarships winners were chosen. 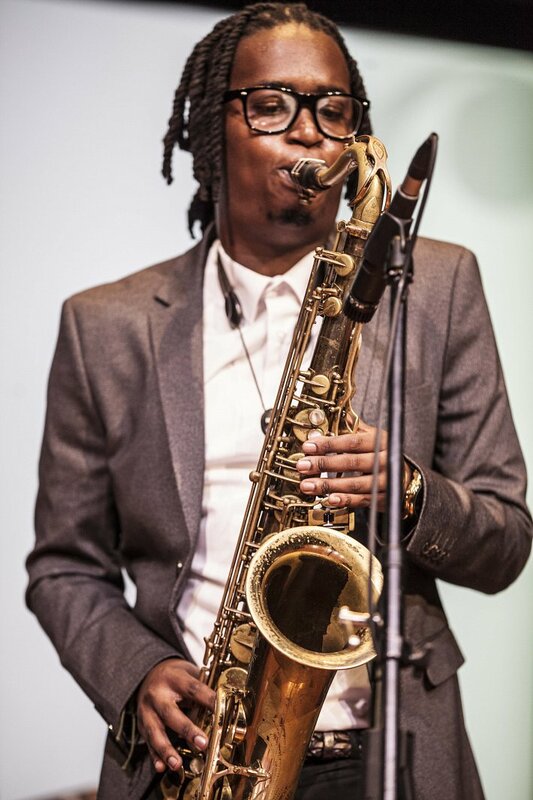 Following a tense final round of live performances, saxophonist Linda Sikhakhane (Jazz music) and marimba player Dylan Tabisher (Western Art music) were announced as the winners of the two R200 000 scholarships – much to the delight of the large audience at the Linder, who had been captivated by an evening of energetic blue-chip performances. Sikhakhane (24) studied at the University of KwaZulu-Natal and is based in Johannesburg, while Capetonian Tabisher (28) studied at Stellenbosch University. Both had entered the SAMRO competition four years ago but had left empty-handed, proving that persistence and hard work eventually pays off. These study awards will enable the two young instrumentalists to pursue career-enhancing music studies or master classes at an international institution of their choice. They also each won R5 000 for the best performance of a prescribed South African composition. Winning R70 000 each were runners-up Benjamin Jephta (bass guitar) in the Jazz category and Sally Minter (flute) in the Western Art Music section. Jephta and Sikhakhane were put through their paces as they duelled for top honours in in the Jazz category. The audience was blown away by their explosive virtuosity while performing their own choice of music, as well as the commissioned work Ilali (Rural Settlement) by 2014 SAMRO scholarship winner Prince Bulo, a gifted young composer. Jephta, a semi-finalist and merit award winner in the 2012 SAMRO competition, used his prize money to buy the bass guitar he was using on Saturday night. He chose to play John Coltrane’s Giant Steps, Blue in Green by Bill Evans and Miles Davis, and Stevie Wonder’s I Can’t Help It. Sikhakhane, on tenor sax, hopes to use his scholarship to attend master classes in Scandinavia. He performed Autumn Briefs (an arrangement of the jazz standard Autumn Leaves) by N Young and P Wettre, as well as Khaya Mahlangu’s Kwa-Guqa and Joe Henderson’s Recorda Me. Adding extra heft to the two musicians’ performances was a dynamic jazz trio consisting of Melvin Peters (piano), Victor Masondo (bass) and Rob Watson (drums). In the Western Art Music category, Minter and Tabisher competed for the scholarship in another closely fought and high-calibre contest. Tabisher’s high-octane marimba set included Bach’s Goldman Variations (MWV 988: Variation No. 23), Paul Creston’s Concertino for Marimba (Ill Lively), and E Séjourné’s Concerto for Marimba and String Orchestra (Il Rythmique, Énergique). Minter, who believes that each flute player has their distinctive sound or “language”, performed South African composer (and former SAMRO scholarship winner) Peter Klatzow’s, as well as Bach’s Sonata in E-flat major (BWV 1031: Il Siciliana) and Frank Martin’s Ballade. In addition to playing their own choice of repertoire, they expertly tackled commissioned works by South African composers: Minter played Emakhaya No 2 Nqandani by Bongani Ndodana-Breen, and Tabisher performed Injesuthi by Clare Loveday. They were accompanied by pianist Elna van der Merwe. A number of subsidiary and merit prizes were also awarded to the semi-finalists on the night. Merit awards of R10 000 each went to saxophonist Justin Bellairs and flautist Tatiana Thaele. The two SAMRO/Bonhams Awards (one in each category) were won by guitarist Keenan Ahrends and flautist Neil Robertson, while the SAMRO/De Waal Award went to trombonist Siya Charles. The evening was made memorable by not only the four instrumentalists’ impressive performances, but also by the knockout renditions of Winston Mankunku’s Yakhal’ Inkomo and Nina Simone’s Four Women by last year’s Jazz scholarship winner, The Voice finalist Zoë Modiga. In fact, SAMRO Foundation Managing Director André le Roux touched on the symbolism of “the power of four” in his introductory speech, noting the significance of the number: four finalists competing in a competition that rotates on a four-year cycle, and the role that arts and culture plays in contributing to the Fourth Estate – the media and civil society. Marking Women’s Month, he paid tribute to the country’s strong female role models – including the four placard-bearers who disrupted the recent election results announcement with their powerful silent protest, describing them as “four women who upstaged the president with a powerful piece of performance art”. The 12 young musicians who competed in this year’s scholarships competition have now joined the SAMRO Foundation’s growing “family” of outstanding music achievers, whose artistic excellence has been applauded on a public platform and their innate talent catapulted to even greater heights. Generations of composers, singers, keyboard players and instrumentalists have been given a professional boost thanks to SAMRO’s sizeable investments in music education since 1962 – including at least four Standard Bank Young Artist Award winners. In addition many alumni of the competition were present at Saturday night’s event. Two of the adjudicators were winners of past competitions; Magdalene De Vries and Gareth Walwyn won the competition in 2006. Mike Campbell returned to adjudicate after 20 years, and Zoë Modiga, last year’s winner, blew the audience away with her performances. Lastly the winner of the 2013 composer’s award, Prince Bulo, contributed a commissioned work for the Jazz candidates. Next year’s SAMRO Overseas Scholarships Competition will be held for keyboard players (including pianists and organists) in both the Western Art and Jazz music categories.